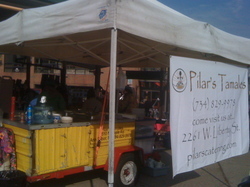 I met Sylvia Nolasco-Rivers of Pilar’s Catering and her family this summer at the Westside Farmers Market. Her vibrant yellow cart was a unique signal to all driving along Stadium Blvd that good food, music, and a smiling Sylvia were present to serve up El Salvadorian specialties. I was recently able to sit down and talk to Sylvia as she and her husband Joe were preparing for Pilar’s next phase. They are stepping into a permanent location on November 23rd: 2261 W. Liberty St.
Sylvia says with a grin, “I’m bringing a few of my friends in here. I wanted to be that for those folks. To showcase them.â€ Roos Roast will be providing coffee to drink and buy in bulk. As you wait for your lunch you can browse for chocolates from Maite of MaiteLaites, biscotti from Barb Gibson of The Biscotti Factory, gluten-free baked goods from Julie at Tasty Bakery, and more. When I teased her about so many familiar faces from the Farmers Market being showcased, Sylvia smiled, “it is community based.â€ Indeed, and more appealing and stronger because of it. Six weeks ago Sylvia signed the lease. She and Joe have worked tirelessly to get the space ready. 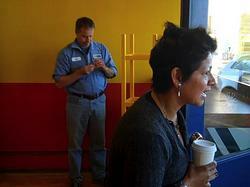 The previous occupants, La Tienda Libertad, moved to a larger location 20 feet away over the summer. 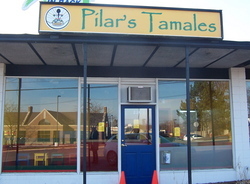 The combination of Pilar’s Tamales and the Latin American grocery store will effectively create a corner of chilis, plantains, and beans in Ann Arbor. I am thrilled - I love beans and rice (even though it is challenging to eat them with chopsticks). When asked by an admirer why she was expanding into a new location given the state of the Michigan economy, Sylvia’s response was, “I refuse to be scared.â€ Here is a video of her vision for the space. Her indoor cart/store/takeaway/counter service space/community food artisans showcase opens Monday, November 23rd. (I can understand why she is telling people to pretend that it is her cart, I have no idea what to call the space!) It will be open from 7 to 7. Look forward to seeing you there! Here is the link to the article at annarbor.com.